My first gig as a researcher was as a 19 year-old NSERC undergraduate summer award field assistant, on the tundra east of Churchill, Manitoba, in a lesser snow goose colony. Results, publications and other stuff from the long-term research that got to be a part of can be found in Yorkspace Open Access Institutional Repository: Churchill Community of Knowledge collection. Although I was washing roots (below-ground vegetation), and counting goose droppings, which is very esoteric, this research was and is part of a huge, applied research question: "how should goose populations be managed?" I've studied economically and agriculturally important species, such as sheep, geese and deer, throughout my research career. Consequently, I've been familiar, from my earliest research days, with the concept that solid research results could, and should, influence and inform policy and management. Today, we call this "evidence-based policy", or "evidence-informed decision making". It's a complex and complicated proposition. Students in my lab. have done field work in many protected areas including provincial and national parks and even a World Heritage Site. Park managers were interested in what the research means for them, and their jobs. This led me to deposit many grey literature research reports done for various funding agencies into Yorkspace (search on Bazely and deer, for example). The idea that academic research may be of interest to communities outside of the university, has always interested me. Over the years, I've worked with many public and private landowners, and in the last 10 years I've really broadened the groups both within and outside of the university, that I communicate with, about my research. 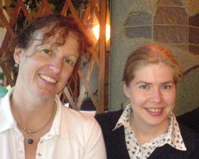 In 2004, I began a research collaboration with Prof. Gunhild Hoogensen Gjørv at Tromsø University in Norway. Since then, I have been exploring and writing about the science-policy-politics nexus in a more scholarly way, that goes beyond simply a general interest in this area. I edited the book, Environmental and Human Security in the Arctic, with Gunhild, and two of our former graduate students. Gunhild is shown at right, with another of her graduate students, Maria Lvova, who has a chapter in our edited volume. My chapter (wit, Christensen, Tanentzap and Hoogensen-Gjørv) in the book attempts to connect the dots in order to link ecological and political science research in a more strategic, systems-thinking kind of way, so that ecologists who lack understanding of the policy ecosystem can locate themselves within it more effectively. Just as the public needs to have a better understanding of science, it's my strong opinion that scientists need a much better understanding of fields outside of their lab. door. I blogged about how scientists can do this, over at IRIS (2006-14), and I also blog on this topic here. Here's a great panel discussion from TVO on YouTube on the topic of science and policy and the public.